Swing Door for Portable Hog Trap Side hinged swing door for traps design is explained. The swing door (side hinge) style is better than the root style (top hinge) door in our opinion, but both work well. It is harder for a pig to escape from a swing door. 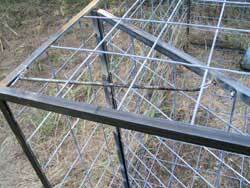 Additionally, if heavy, root doors may dissuade more pigs from entering the trap after the first is caught. Pigs can't root open a swing door from the inside, so a very light spring can be used, which allows more pigs, and smaller (good for eating) pigs to enter the trap. You'll want your door to have about 1/2" clearance top and bottom. Too little, and if it is bent it may require a lot of tweaking to get it open again. Assemble the door so that the top and bottom cross pieces overlap the vertical upright pieces, resulting in the 24" x 49" outer frame. Tack weld the frame at first, and ensure that the door is perfectly square (Fig. 1). If it is not, it may hit the frame when opening. Install the paneling. Take extra time to ensure that the welds are good, as the door will receive some amount of punishment (Fig 2). Finally, evenly space and weld in the interior cross pieces on top of the panel. They should be installed on the back side, so that the door may close fully against the door jamb. Weld your completed door frame to the hinges, careful to position the hinges so they open straight. Now place the door inside the trap, and position it at the approximate angle that you'd like it to close at. This will show you where to add the upright at the front which the hinges will be welded to. You will want the door to close at an angled inset so that the hogs can more easily find thier way in the trap. See Fig. 3. Weld in the hinge support, then weld the door hinges to it, or bolt them if you so prefer. Add the door jamb where the door closes against the frame. This strengthens and supports the stress of hogs trying to escape. Any spring that has enough tension to stretch so the door can open wide enough, and springy enough so that it can then then can pull the door closed without becoming stretched out should work. It should not be so tight that small hogs can not push open the door from the outside after it has been closed. 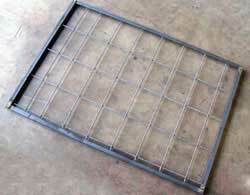 We use standard screen door springs that are approx 14-18" long. Refer to Fig. 4. Attach one end of the spring to the front corner of the trap. It will take some trial and error to find the right place to install the spring on the door. You might drill holes in the door frame where the spring can be latched in to. 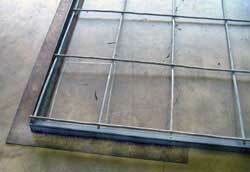 Finish the trap by adding the paneling to any uncovered area and then inspecting all your welds for strength. The front and rear of the trap will be the most critical because a hog can get up a little speed before crashing into them.